The Immersive Summit will dive into the stages of producing immersive content (with a focus on VR & AR) from pre-production and finance to production, post production, brand partnerships and other distribution models. 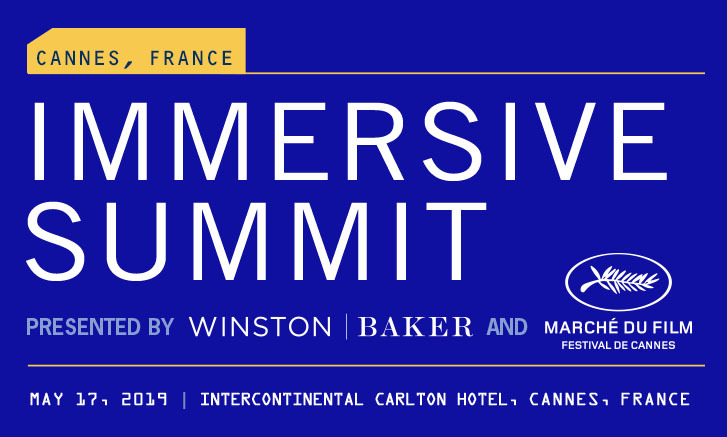 Marché du Film participants will be offered free access to the Immersive Summit - depending on availability. In order to guarantee seating, please register online by April 30. Marché du Film attendees will also benefit from the rush line entrance to the Summit. Winston Baker will also present the 10th Annual International Film Finance Forum at the Carlton Hotel in the afternoon of May 17. The International Film Finance Forum is geared towards global strategies for financing films in a changing marketplace. Marché du Film participants will be offered a 50% discounted rate to the Forum : register here.